Chaythoos is a raised point of land on the north side of Stanley Park and is where Stanley Park declared open by Mayor David Oppenheimer in 1888. Lord Stanley, for whom the park was named, visited here a year later to dedicate the park. The first nations name "Chaythoos" means High Bank. It is a great viewpoint and has a few significant trees and plaques. Where is Chaythoos in Stanley Park? Chaythoos is located just steps up from the Stanley Park Seawall between Lumbermens' Arch and the Lions Gate Bridge. 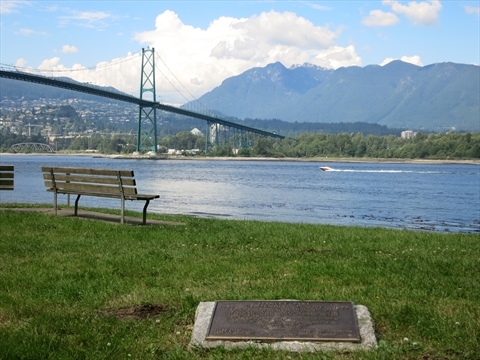 Located at Chaythoos is the Stanley Park Centennial Plaque.